The April issue of Total Girl magazine is out and in your (Australian) Supermarket or Newsagent right now. 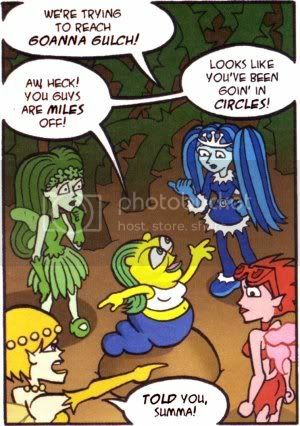 In this episode of Dillon's Rock 'N' Roll Fairies - drawn by me - they encounter a new character and the middle part of the story begins. If all stories fall into the category of either The Iliad or The Odyssey, then we're about to cross from the latter, journey-type, narrative into something more like the former - except starring Fairies and lots of bugs! you even fixed my typo that went to print. Heehee, with one frame in focus I figured it'd be sensible. From what I've seen, most kids will read right over the word anyway and as a typo it'd need pointing out. Last month was: what bird is that? This month: Who can name the RNRFs typo (apart from Dillon)?